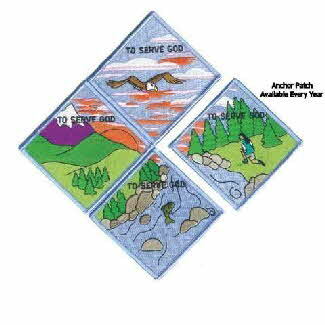 The My Promise, My Faith pins are IN ADDITION to the traditional Religious Emblem program described below (which are partnership programs between Girl Scouting and specific religious organizations). The pins DO NOT replace the traditional Religious Emblems program, but instead supplement it, and make a faith-based recogition a possible part of every year in Girl Scouting. The traditional Girl Scout Religious Emblem program offers a partnership between the girl’s family, the family’s religious leaders, and Scouting, to explore age-appropriate faith issues, at the satisfactory conclusion of which the award is earned. To be age-appropriate, there are four separate Religious Emblem programs by grade level - for girls in Grades 1-3, then Grades 4-5, then Grades 6-8, and finally Grades 9-12. Since Troop 1806 is a multi-level troop serving only girls in Grades 1-5, the programs for Grades 1-3 and Grades 4-5, are relevant for our girls. GSUSA does NOT promote or advance any particular faith. The Girl Scout promise contains this phrase: To serve God* and my country, with the * making clear that the word "God" can be interpreted in a number of ways, depending on one's spiritual beliefs. When reciting the Girl Scout Promise, it is okay to replace the word "God" with whatever word your spiritual beliefs dictate. There are approximately 40-50 different religious faiths and denominations which partner with GSUSA for the Religious Emblem program (see partial list below). Each faith or denomination partnering with GSUSA has developed a curriculum and workbooks for its own Religious Emblem Award, age-appropriate by the four grade levels referred to above. Girl Scouts who complete their faith’s Religious Emblem program, for each grade level in which earned, receive a Religious Emblem medal and patch, both of which can be worn proudly on the Scout uniform. The choice of working on the Religious Emblem Award is completely optional with the Girl Scout. Troop 1806 girls who earn a Religious Emblem for their faith will have two different award presentations. The girl’s own religious organization/church will make the main presentation of a medal and/or certificate for the girl. The girl can also elect to have the medal and/or certificate presented at a Scout Sunday observance. Troop 1806 will present to the girl a P.R.A.Y. patch, as well as the “religious knot” used by our brothers in the Cub Scouts. Both the patch and the “knot” can be put on the uniform, along with the medal that may be awarded by the girl’s religious organization/church.